I had wanted to make a Turning Twenty for a while, but have been waiting for some fabric to speak to me. The Friday before Christmas this year I went to my LQS to get a spool of thread................and there it was! 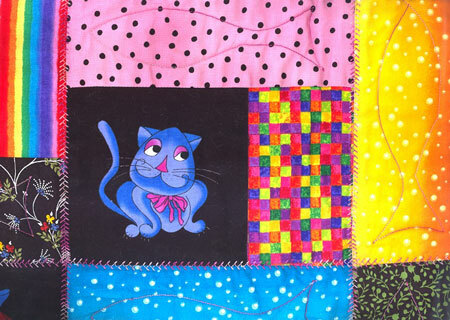 The CAT fabric in this quilt was screaming at me in the shop. I just had to have it and it fit right into my thoughts because I wanted to cut the pattern in half and make myself a lap quilt. 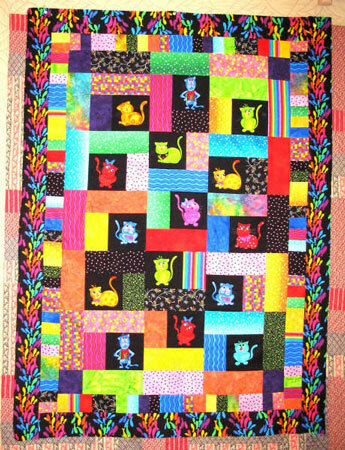 The cats blocks on this fabric were 5 1/2 inches square, go figure! It was meant to be. SO, the shop was not busy, I fussed around and picked 19 additional fabrics that I felt coordinated with the cats and they cut me fat quarters. I'm sure I could have done this from my infinite stash but it was much more fun doing it just for this project! Because I was working in 1/2 scale, I had plenty of extra fabric so I added the additional borders to bring it up to a lap quilt size. I used some strips I had cut and cut some more and sewed them together, then cut one of my borders from those. The "fishes" for the last border are a flannel. I have used them for the whole back of the quilt too. So it's nice and cozy to curl under. The little picture is detail of my machine quilting. I do not have a long arm, so the fish were a little challenge, but they went ok. 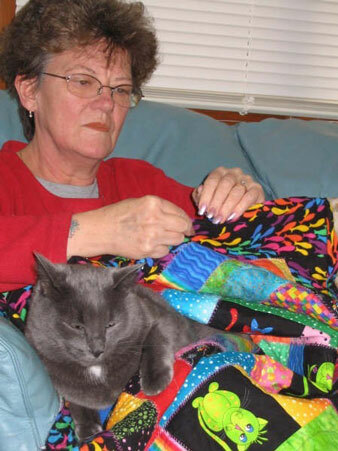 The picture of me hand sewing the binding has my Quilt Inspector Dennis in my lap. I was sitting on the sofa sewing, he climbed up and HAD to be in my lap on HIS new quilt (he is a flannel addict). OH, by the way, I started this quilt the day after Christmas and it was finished the day after New Years! That is with all the rest of life being in there too. It's a nice fun quilt to make. I have all the fabric ready to do a "man" version in deep tones. Can't wait for the week-end to get started on it.